WhatsApp has dominated tech news this week after being bought up by Facebook, but for Vodafone customers it was a case of 'What's up?' on Friday, as network issues prevented them from using the app. The network responded to complaints from Twitter followers, unable to access mobile data services on their devices throughout the day. Vodafone tweeted to tell users it working on the issue, before admitting they may have to deal with intermittent access to messaging apps such as WhatsApp and Apple's iMessage for the time being. As most Brits finished their working week, the company claimed everything was now up and running as normal, but it would continue monitoring the situation. 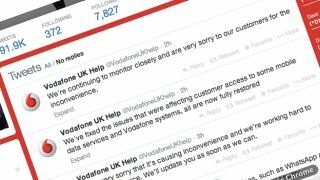 "We've fixed the issues that were affecting customer access to some mobile data services and Vodafone systems, all are now fully restored," Vodafone tweeted, five hours after acknowledging the issue. While these things do happen from time to time, Vodafone customers are sure to be miffed after the second major outage of 2014, left many on social media vowing to take their money elsewhere. In January the company battled a "nationwide issue sporadically causing problems with voice, data and SMS services," which lasted for a number of hours.